With the number of music festivals taking place around the world and the increasing use of live performances as source material for commercial CD releases of classical music it is, perhaps, not surprising that we are increasingly being treated to highlight discs from these festivals. 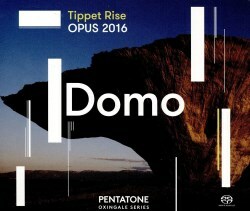 Hot on the heels of the Schloss vor Husum 2016 CD I reviewed recently, here is another offering, compiled from the inaugural series of concerts given at the Tippet Rise Art Center – which is set in a 10,260 acre working sheep and cattle ranch. The programming might fairly be described as unconventional. Two significant pieces of Scriabin bookend the disc – ostensibly because the intention was to celebrate Scriabin’s centennial (which actually occurred in 2015) and these two works were composed at the same time and have other compositional links. We also get three works by the contemporary Aragonese composer, Antón Garcia Abril, two complete pieces – Rachmaninov’s Vocalise (transcribed for ‘cello) and a Chopin Nocturne, and isolated movements from larger works: the third of Stravinsky’s “Three Pieces from Petrushka” and the second movement of Rachmaninov’s First Suite for Two Pianos. We start with what will probably be – for most people – the highlight of the disc. Scriabin’s mystical Fifth Sonata is available in some extremely well-received performances by artists such as Marc Andre Hamelin and Stephen Hough but even their efforts are, to some extent, sidelined by the titanic performance here from Yevgeny Sudbin. After a thunderous beginning we are rapidly propelled through the convulsive and voluptuous spasms of this peculiar work, enjoying a huge dynamic range (very well captured). In fact, there is a tendency for the performance to be either very loud or fairly soft, with nothing much in between, but I suspect this is, at least partially, down to the venue acoustics. The overall timing for the performance is fast (10:45) compared with Hough (12:25) and Hamelin (12:46) but it certainly doesn’t sound rushed and the contrasts between languid eroticism and eruptions of blistering sonorities are convincingly achieved. Given that this is a live performance this is irresistible. Next come the Abril compositions. Abril’s career seems to have been focused predominantly on film and television music through the 1960s to 1980s and, thereafter, more on instrumental and orchestral music. Here we get two songs (“But I’m lost without you” and “Piano Maker”) and the second of Tres piezas amantinas - three piano pieces invoking young girls in love. The idiom is tonal and lyrical, although it is a little difficult to pin down precise influences. The second song (the sixth from a set of seven) reminded me of Korngold in meandering mode and the piano piece was, perhaps not surprisingly, reminiscent of Mompou. Emily Helenbrook is a young soprano with a pure, sweet voice that sports a fast vibrato and reliable intonation, although she doesn’t yet quite have the flexibility of style that would make her singing of these songs ideally fluent. I suspect that she is not helped by the reverberant bloom of an acoustic that makes her louder notes blare a little. While she makes a pretty good job of these songs, well accompanied by Christopher O’Riley, two of them were enough for me. Abril’s meditative piano piece is rather too elaborate to rival some of Mompou’s better offerings and its central section slightly intrudes into what could have been more atmospheric. Strangely, after a brief silence (at 4:42) we get what brief research suggests is an epilogue – although it appears to be a completely separate, rather filigree, piece of quite distinct character. O’Riley plays it all well but I could have done with a rather dreamier performance. That said, O’Riley is a major feature of these concerts, appearing in six of the pieces presented here and, whilst his name is new to me, he is clearly an estimable artist. Next, there is Rachmaninov’s ubiquitous “Vocalise” in a transcription for ‘cello and piano. This is played rather fulsomely by Matt Haimovitz - so that O’Riley’s accompaniment is, initially, slightly overpowered - but the ‘cellist does achieve more appropriate reticence later. Stravinsky’s Trois Mouvements de Petrushka is one of the summits of the standard keyboard repertoire and is becoming the go-to piece for young virtuosi to demonstrate their performing credentials - in much the way that Ravel’s ‘Scarbo’ and Balakirev’s Islamey used to be before. Having attempted to perform this work in concert myself I am only too clear about the technical hurdles that need to be overcome and they are formidable. Part of the final movement is even set out across four staves and, with the help of huge simultaneous leaps in each hand, is evidently intended to suggest that four-hands are being employed. It is this final movement, “The Shrovetide Fair”, that we get here - performed by Jenny Chen. Chen is a new name to me but, like Yuja Wang, she is a pupil of Gary Graffman and hers will be a name to watch. Pollini’s is probably still regarded as the top performance of the complete work, although Wang’s runs it close. When I saw Pollini performing the work in concert at the Festival Hall I noticed that, on that occasion, even this great artist could not quite produce a completely clean “four-hand” section, live. Chen’s live performance does pretty well, though. She does not start particularly fast but seems to accelerate rapidly. Most of the trickier sections are very clean and dynamics are all appropriate (surprisingly, the score does not provide many). By the time we get to the “four-hand” section Chen is going like a rocket and, although she subsequently slows down a bit, she completes the movement in around 8 minutes – which compares with 8:30 for Pollini and 8:46 for Wang. Very impressive! What a pity we couldn’t have had the whole work – there was plenty of room for it on the disc. Sadly, an astounded audience member’s gasp slightly intrudes on the very end of the performance. The second work of Rachmaninov we are given is the Adagio movement from his First Suite for Two Pianos, Op.5, where O’Riley is joined by Anne-Marie McDermott. This is also a terrific bit of playing (with breath-taking scales) and, here, the acoustic seems very much at the service of the performance. In fact the recording here is demonstration quality and it puts in the shade one of my old favourite recordings – that by Previn and Ashkenazy. Again, what a pity we only get a single movement of the suite! Stephen Hough’s Chopin Nocturne (Op.15/2) comes next. Unlike many other pianists Hough takes the Doppio movimento middle section faster rather than slower (the score indicates no particular differentiating tempo marking) taking 2:45 overall. Listening to it for the first time this aspect didn’t quite work for me, although this is a fine performance. For comparison, Angela Hewitt takes 3:32 and Garrick Ohlsson takes as long as 4:17. The acoustic here seems different from that of the rest of the disc – rather more open than earlier in the selection of pieces, but not better. To finish we get an arrangement of Scriabin’s “Poem of Ecstasy” (also known as his Symphony No 4) for two pianos and trumpet. Irritatingly, the identity of the arranger is not provided but he/she has done a splendid job – despite having to employ a lot of tremolando effects to suggest sustained notes. This version provides a perfectly viable alternative way of experiencing the work and, without the full orchestra, it is easier to appreciate its sheer complexity – and to hear the subtle ways in which the trumpet mute is employed (something I hadn’t noticed before). I received the same kind of feeling listening to this that I had had when hearing “La Mer” and “The Planets” in their two-piano versions for the first time – rather like watching a black and white performance after one in colour, except that there is really plenty of colour here. OK, there is also a trumpet but it would have been unreasonably difficult to transcribe its contribution within the piano parts. O’Riley is partnered by Svetlana Smolina, with Elmer Churampi on the trumpet (both new names to me) and they finish the disc in real style. I hope they get plenty of opportunities to perform it – it must have been a lot of work to learn. The booklet notes provide track identifications, brief artist biographies and a great deal of artistic woffle to accompany photos of the rather peculiar venue. The “Domo” referred to is a strange, low, mushroom-like artificial megalith with two stalks – one of the scenic attractions of Tippet Rise. The photos suggest that performances actually take place outdoors with the musicians under the structure and the audience sitting in the open (at the mercy of some nasty-looking black rain clouds). I suspect that most of the recordings provided here were made in the nearby Olivier Music Barn concert hall – possibly because of the threat of rain - but use of the outside setting might just explain the acoustic of Stephen Hough’s contribution. So, a bit of a curate’s egg but mostly extremely well recorded and worth hearing, not least for Subdin’s fabulous Scriabin’s Fifth Sonata.